The Speaking test is the shortest part of the IELTS exam, lasting only 11-15 minutes. However, for many test-takers this brief experience can seem to last an eternity! IELTS Speaking is a quick, but intense in-person interview. It requires focus, creativity, and strong English skills to think of responses to the interviewer’s questions quickly. It is very important to relax and remain confident during the IELTS interview. Being alert but calm will help you do your best. How can you achieve this? The best thing you can do is study and prepare. Knowing what to expect on the IELTS Speaking exam, practicing a variety of strategies, and answering many, many practice questions will help you on exam day. This Guide to IELTS speaking covers what you need to know about this short, but challenging part of the IELTS exam. We’ll start with basic (but important!) information to introduce you to IELTS Speaking and how it’s scored. The second half of the post focuses on each of the three main parts of the test, with tips and strategies to help you develop your approach. Read on to learn how to tackle IELTS Speaking! IELTS uses a “paper” format for its Reading, Writing, and Listening tests, all of which are completed together in one sitting. Speaking takes place separately. In most cases, Speaking interviews are scheduled on the same day as the paper test. However, sometimes the interview can be scheduled up to one week before or after the paper exam. You will receive instructions about this when you register for the IELTS at your local test center. When you take the Speaking test, you will enter a room where your examiner will be waiting to greet you. He or she will ask you to identify yourself, and your Speaking test will begin immediately after that. To get an idea of what the test is like, check out this short video. The student is answering IELTS Speaking questions in Part 1 of the exam. The IELTS Speaking Test has three parts. We will look at each part in depth later in this post. For now, let’s just get familiar with each one. Part 1 is like a personal interview. It lasts about 4-5 minutes. You will in introduce yourself and talk about IELTS Speaking topics related to your life and your experiences in response to the examiner’s questions. Think of this interaction as “small talk.” These are the kinds of questions you might exchange with someone you just met. Part 2 is called the “long turn.” Here, you are given a question on a topic and some sub-points you must cover in your speech. You will have a minute to prepare a response, and your goal is to speak for about 2 minutes. The examiner may ask you some follow-up questions when you finish your short speech. Finally, you’ll have a conversation on the same (or similar) issue you spoke about in Part 2. This will be a discussion, much like the first section of the exam (Part 1). However, the questions are more complicated because they require you to offer an opinion or some analysis. To illustrate, imagine your Part 2 topic is to describe a happy memory from your childhood. In Part 3, the examiner could ask you: “What are some important things a person should do in order to live a happy life?” Here, the theme of “happiness” connects both sections. Official IELTS practice tests and textbooks with practice exams can also be fantastic resources to help you prepare for the Speaking test. The Official Cambridge Guide to IELTS includes a DVD with videos of IELTS Speaking sample responses representing a variety of Band scores. 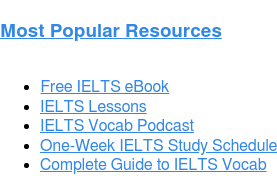 Here is a list of excellent IELTS resources that may help you in Speaking and other areas of the exam. IELTS uses four scoring categories to assess your speaking skills. Make sure to study these “Band descriptors,” which IELTS uses to assign Speaking Band scores. To help you understand the grading schema better, let’s take a look at each category. Fluency and Coherence are measurements of a speaker’s ability to communicate logically, clearly, and without difficulty in English. For Fluency, a perfect Band score of 9 means the speaker doesn’t have to pause to recall words, or mentally review grammatical structures. The speaker can focus on the message she wishes to convey rather than the language needed to say it. Coherence is related to fluency, but slightly different. It measures how well a speaker’s ideas make sense together. A high Band score indicates that a person can use a variety of cohesive features and discourse markers with ease in order to articulate ideas in a clear and logical way. 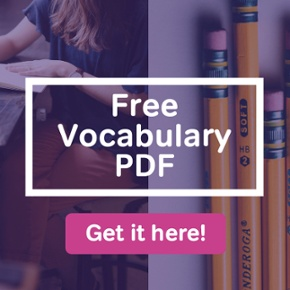 This scoring category measures vocabulary. You will be assessed on your ability use words appropriately (in the right context) and accurately (with the correct meaning). IELTS Speaking rewards test-takers with large vocabularies. 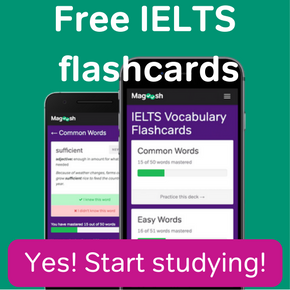 If this is a concern for you, Magoosh offers free IELTS flashcards to help you learn words you should know for the IELTS! We also have a handy vocabulary lesson video below. The examiner will be listening carefully to assess whether or not you you can use a wide variety of words and phrases (which is good), or whether you use the same language over and over again (which is bad). Related to this, you will also be assessed on whether or not you can accurately paraphrase the examiner’s questions fluently. See the tips and strategies chart for Part 1 (below) to learn more about paraphrasing the examiner’s questions. Your grammar will be assessed on the Speaking exam. You should try to use a wide range of grammatical constructions appropriately and accurately. Keep in mind that your grammatical range score is not simply about avoiding grammar mistakes. Limiting errors is important. However, you can only reach a very high band score if you can also demonstrate that you have mastered complex sentence structures, verb tenses, and other advanced grammatical features. If your grammar skills are limited, or you have a lot of grammar mistakes when you speak, it is especially important that you record yourself when you answer practice questions. Listen for errors that you make regularly and think about how you can fix them. Get feedback on your grammar from a native English speaker if at all possible. If you have enough time before your exam (a few months or more), consider taking a class or investing in a good grammar book for self-study. IELTS Speaking also measures your pronunciation. Top Band scores only go to those test-takers whose pronunciation is “effortless” for a native English speaker to understand. Scores are reduced for mispronunciation, especially if pronunciation problems make it difficult to comprehend a speaker’s message. Keep in mind that pronunciation involves more than just articulating individual words correctly. Many students have even larger pronunciation problems at the sentence level. These problems occur when a student doesn’t have a feel for native-like rhythm or intonation patterns. Unfortunately, there is no easy fix for most pronunciation issues. Generally, the best way to improve is to use your English in daily life. If you can’t use English on a regular basis, then it can be helpful to listen to recordings of English speakers. Pause the recordings occasionally and attempt to pronounce entire sentences exactly the same way as the speaker. Try to copy the speaker’s tone (the rise or fall of the voice). Also try to copy how the speaker speeds up, slows down, and pauses throughout the sentence. Even try to mimic the speaker’s emotion! You may feel a little silly doing this exercise, but that is actually a sign you’re doing it correctly! Over time, you will develop your ear to hear the sounds of English and reproduce them more accurately. IELTS Speaking has three parts. In this section, we will take a close look at each one and consider some strategies and tips to help you boost your score. We’ve also compiled our tips and strategies for Parts 1, 2, and 3 into a cheat sheet, so you can take your studying on the go. If you’ve had an opportunity to interact with English speakers, it is very likely that you have already answered questions that would fit in Part 1. They target basic personal information about things like your school, hometown, family, or possibly even the weather in your hometown. Treat Part 1 like a warm-up for the rest of the exam. If you’re feeling nervous about the test, hopefully by the end of this section you will feel more comfortable and prepared to tackle Parts 2 and 3. To familiarize yourself with this section of the test, you can refer to an official IELTS Speaking sample. Take a look at this official Part 1 prompt, recording, and transcript. The answer may be “yes” or “no,” but you shouldn’t stop there. Always expand your answers and say more. Paraphrase the question No matter the question type, it can be very helpful to begin your response by restating a portion of the question. However, you should try your hardest to paraphrase the question in your response rather than simply repeating what the examiner said. Question: Who helped you with your homework when you were in school? Better response: “My sister helped me study when I had difficult assignments in school. Best response: When I had a difficult school assignment, my sister was always there to assist me. Stay on topic Don’t allow your responses to wander away from the question the examiner asks you in Part 1. Your answers do not need to be long--a few sentences is fine. When you’ve answered a question, stop talking and let the examiner ask the next question. If you’re feeling nervous, it can be very easy to lose focus and take the conversation away from the original question. You may lose points for this. Also, the more you say beyond what’s necessary, the more likely it is that you will make mistakes! In IELTS Speaking Part 2, you will receive a “topic card” that contains a detailed, multi-part question. Take a look at this official IELTS Speaking sample prompt, script, and recording of a Task 2 question to get a sense of what to expect. You will have one minute to prepare a short speech in response to the topic card. Then you should speak for 1-2 minutes. The right side of the card below shows the typical appearance of a Part 2 question. The notes on the left (not included on an actual IELTS topic card) highlight the three main features of this question type. Feature 3 → Describe a time when you gave someone advice. and explain why you gave the person that advice. You have one minute to plan your response before you speak. That may not seem like a long time to think of a response to all of these questions, but fortunately, planning a Part 2 response is simpler than it may look at first. You will be provided with a pencil and some paper to plan your response. I advise students to read Feature 1 and Feature 2 first, BUT, avoid writing notes about these questions. The best approach is simply to use these points on the card as reminders about what you need to say. At the beginning of your short speech, go through each point one-by-one with a brief response. This simple response answers each of the questions listed in Features 1 and 2 very directly. Without much planning or thought, you can go down the list and supply the necessary information to cover these points. Do not skip anything because you will be marked down for missing information. Nevertheless, you can move through these points quickly in order to get to the more detailed response you will provide for Feature 3. You should use most of your one-minute preparation time to plan your response for Feature 3. This point requires more detail and depth than the other talking points on the card. As you prepare, your goal should be to come up with at least two main points for Feature 3. Hopefully, you can also think of some details and examples to support these points during your one-minute prep time. Keep in mind that you won’t have time to write detailed notes with complete sentences. Just write down a few words as reminders of what you plan to say. Below is a sample of some notes related to the topic card above. For clarity in this blog post, I added more language on these notes than you would have time to include on the real exam. Reason 1: My friend was failing his classes. Detail 1: He was almost kicked off the basketball team. Detail 2: His college plans were in danger. Detail 1: He hated to do homework, but he always knew the answers in class. Detail 2: He just needed someone like me to motivate him. Answer all of the questions As noted above, don’t skip anything listed on the topic card. Stay focused Make sure you respond very directly to the prompts on the page, and don’t discuss unrelated topics. Timing Use your preparation time to develop an answer to Feature 3 (discussed in detail above) of your topic card. This part of the card requires an extended response with main points and supporting details. Do not waste time writing out notes for the first questions (Features 1 and 2). Use the topic card as a reminder of what you should say. Write Simple Notes You don’t have time to write out lengthy notes in one minute. Even if you had more time, your examiner would penalize you for reading responses that you wrote out ahead of time. Write notes as reminders of what to say. Paraphrase As with other sections of the Speaking test, make sure you paraphrase anything that is similar to the language on your topic card. You will be marked down if you use too much language taken directly from the card. After Part 2, the examiner will ask you a few “rounding-off” or “follow-up” questions. 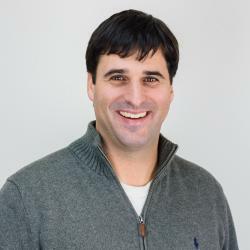 These questions will be related directly to the topic of your short speech, usually requesting clarification or further detail about something you said. However, after one or two of these questions, the exam will quickly move to the final section: Part 3. Part 3 of the IELTS Speaking exam should feel like a smooth transition from Part 2. The first topic of Part 3 will always relate to the topic of your Part 2 monologue in some way. Yet, this time you will not have any time to prepare your responses. What are some qualities of an excellent teacher? What habits lead to success in school or work? In what ways will life be better for the generations that follow yours? Take a few minutes to look at these official Part 3 questions and responses (here is the transcript) to get a good sense of Part 3. To succeed in Part 3, you must remain calm and focused on the examiner’s questions. Your only job is to demonstrate your English abilities by responding with as much detail as you can. Your goal should be 1) to provide a direct and clear answer to each question and, 2) to support each answer with at least 1 or 2 examples or details. When you’ve finished speaking, your examiner may ask you a follow-up question, or she may change the topic entirely! Just follow the examiner’s lead wherever the conversation goes. As you might imagine, the number of questions you receive in Part 3 depends on how much you say in your responses. If your answers are very short, you may get a lot of questions. If you speak with more depth, you will receive fewer questions. In general, you can expect that the examiner will cover 2 – 3 different IELTS speaking topics in Part 3. Part 3 questions normally require you to respond with your perspective on a topic. There are no “wrong” or “right” answers to these questions. Furthermore, keep in mind that your examiner is not grading your ideas. You are only graded on your ability to answer the questions appropriately in English. Your Part 3 responses must always answer the questions directly, and they must be reasonable and logical. However, you are not required to express your “true” opinions. Since you don’t have much time to think during Part 3, it is often better to go with the first thing that comes to mind. Your goal should be to provide fluent responses. That’s it. As much as possible, respond by discussing ideas you know how to express in English so you can display your skills. Avoid saying things that you can’t discuss fluently, even if those ideas would represent your perspective more accurately. When necessary, buy some time to think…. The speed of Part 3 can be challenging. Sometimes, it may help you to slow things down so you can gather your thoughts before speaking. This is especially true if you don’t fully understand the examiner’s question. It can lower your score if you have too many long pauses, or if you stumble over a lot of words. It can also lower your score if you simply repeat the examiner’s question as you think of your answer. Try to avoid this by using one of the tips below. They can help you to gain a few precious seconds to think about what you want to say! NOTE: You should only use these when truly necessary. Try your best not to use any of these tips more than once. 1. Ask the examiner to repeat the question. 2. Comment on the question. Example: “That’s an interesting question. I would say that…. 4. Ask about the meaning of a word. Note: Only ask about the meaning of a word if you truly don’t understand. Just answer... No matter what, you must attempt an answer to each question. Don’t give up! In case you missed it earlier in the post, make sure you check out this extensive list of sample Part 1 and Part 2 questions that we’ve put together at Magoosh. Magoosh IELTS Prep also offers lessons on IELTS Speaking to help you boost your score. Many students who need guidance with Speaking also need some assistance on other sections of the IELTS. Here are some Guides to IELTS Writing Task 1 and Task 2, and here is a Complete Guide to IELTS Listening. Finally, if you need some help organizing your studies, this one-month study schedule can help. If your time is more limited, get to work with this one-week schedule! Good luck with your IELTS preparation, and happy studying! How important is my pronunciation in the IELTS speaking test? I’m studying for IELTS. Listening and reading sections are easy to study. But writing and speaking are difficult for me. I saw your website and app. What kind of support do you give for writing and speaking? Hi Zeynep! Thank you for your question. We offer video lessons with tips and strategies covering all four sections of the exam. We also offer practice questions. For Writing and Speaking, each set of questions comes with an explanation video to help you think about how to organize and articulate your answers. You can give it a try for a 7 days to see if it will help you! We will provide a full refund if you wish to cancel for any reason within the first 7 days. 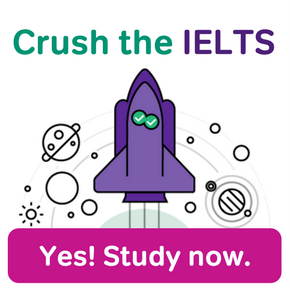 Is it very difficult to reach IELTS level 7? Your question is a difficult one to answer! Yes, achieving a band score of 7 in the speaking section would be difficult for someone who does not have a deep knowledge of English and a lot of experience speaking it. However, for someone who possesses a strong command of English, achieving a band score of 7 might be easily within reach. Here is my advice: start with this IELTS Speaking scoring form. If at all possible, consult with an English teacher (or at least a native English speaker) to help you measure your skills in relation to the band score criteria listed on the form. This should give you a good sense of how well you might score, and what you need to work on to achieve the score you need. Hi and thanks for the IELTS tips and guidelines you have shared. Super helpful! I have one question about the Speaking test. In the case where one is expected to speak about something he has no experience in, what strategies would you advise such a person to adopt? An example: Jane is presented a task card for Part 2, to talk about a museum she likes. However, Jane hasn’t been to any museum, ever. I assume she has to make up stories for the sake of the test. But is it okay to indicate that one has no knowledge about a given topic? Hi CJ! Great question. Many of my students are concerned about this. 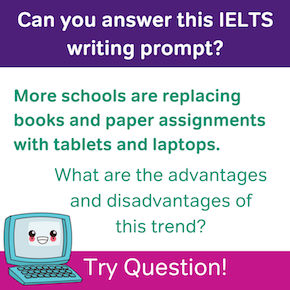 The creators of the IELTS Exam try to write questions that are general enough for most people to answer from experience. The example you provide is a good one. It would be reasonable to expect that most people have visited museums, and would therefore have something to say about their experience. In the rare case that a test-taker has no experience with the topic of an IELTS interview question, it would be okay to mention that to the interviewer. The interviewer may pose the question a different way, or ask a different question. However, I would not advise using this as a strategy for questions you find difficult to answer. It is best to attempt a response. It may be necessary to make up details or say things that don’t represent your true perspective sometimes, and that’s okay.